Article on Navy Luger Proofs. 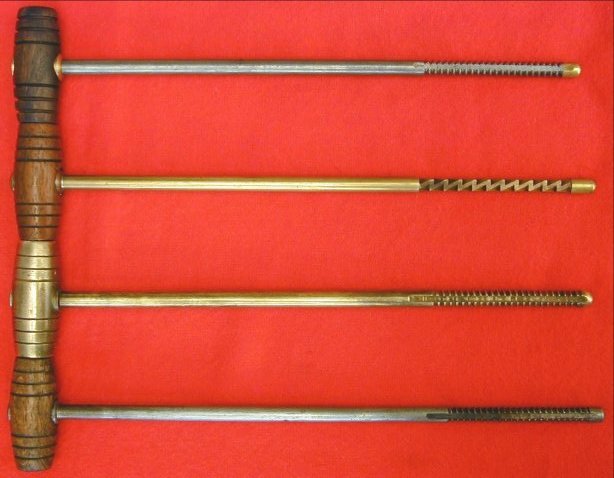 Four variations of the Imperial navy Luger cleaning rod. Imperial Naval dirks and bayonet. 1916 German Imperial navy flyer. 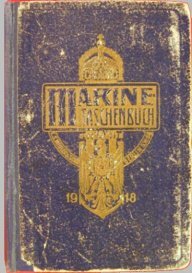 Book of Naval rules for Kaiserliche Marine sailors. 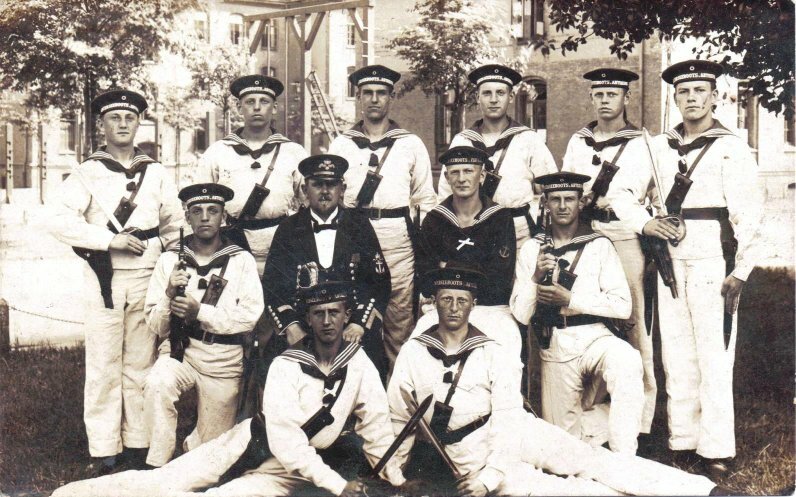 Details of all the type of guns in the Kaisers navy. 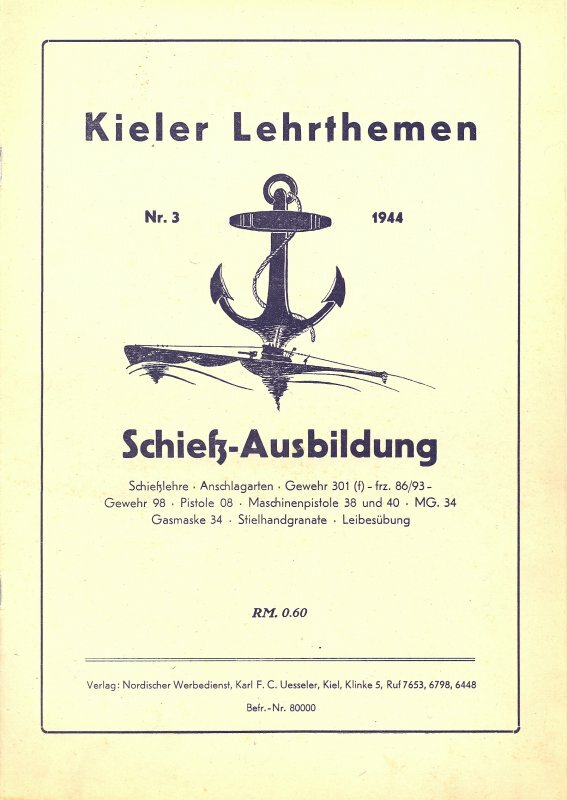 1944 No.3 Kieler Lehrthemen Schießz-Ausbildung pamphlets. Click here to view the back side of the above post card. Mouse over the post card for a close up of the sailor's caps and P.04 rigs. 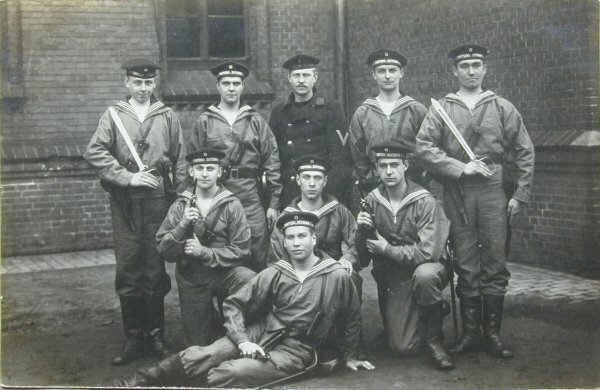 Note the cap tallies clearly indentifies them as Unterseeboots-Abteilung or “Submarine Division” troops. 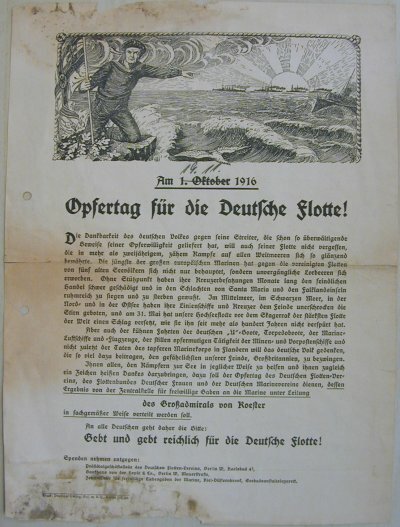 The above WWI flyer was distributed to German citizens to appeal for donations to support the German Navy war effort. 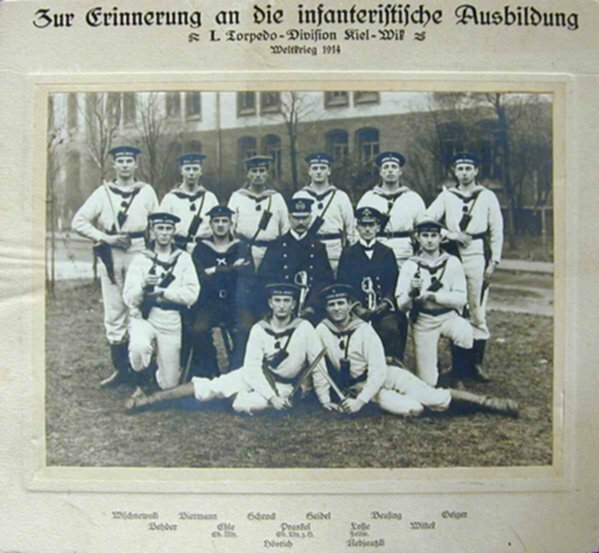 As it says on the flyer, this offering day was organized by the German fleet-union, the fleet-union of the German women (back) and the German navy-unions to support all our (German) combatants on all oceans and demonstrate our (German) profound gratitude. Large format Navy Luger rig photograph in the featured collection. The photo measures approximately 9" x 7" and is matted and identified with the division and location and at the bottom, all the soldiers are identified by their name and rank. The overall size including the original backing is 10-3/4" x 9-3/4". This digital copy, although very good, does not show the sharpness and crispness of the original photograph. Looking at the original, if it were any clearer one could almost see the dirt in their fingernails or almost read the serial number on a couple of the guns! 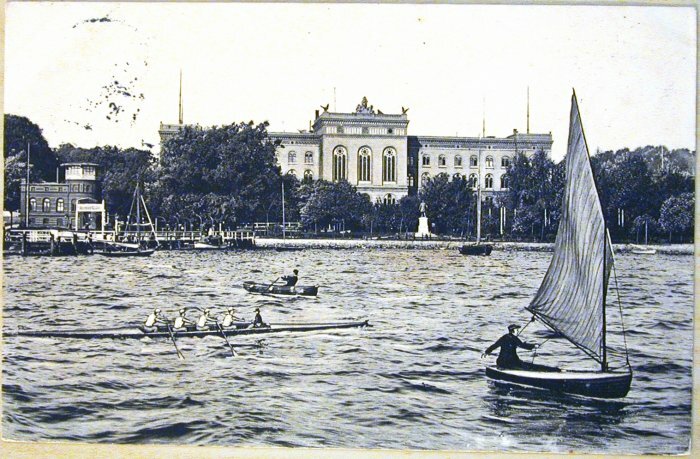 The Kaiser Marine Akademie in Kiel is pictured in the background of the above photograph. It appears that several of the boats in the foreground were added to the picture by an artist's rendering. Look closely at this picture and the one below. 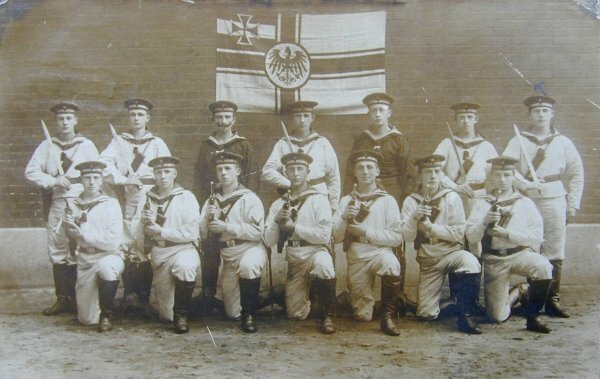 The photographs show two different groups of sailors standing in front of the same flag and brick building. It would appear that each of the photos were taken on the same day due to the exact same positioning of the flag in each picture. 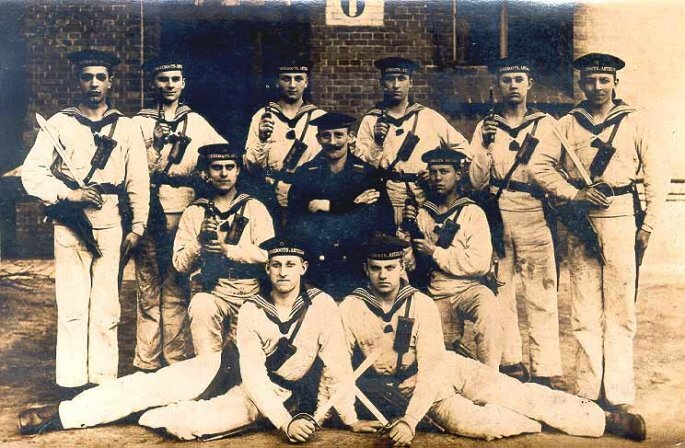 No less than eleven Imperial German navy officers or NCOs or possibly enlisted rank personnel, sporting winter coats and complete Pistole 1904 navy Luger rigs. 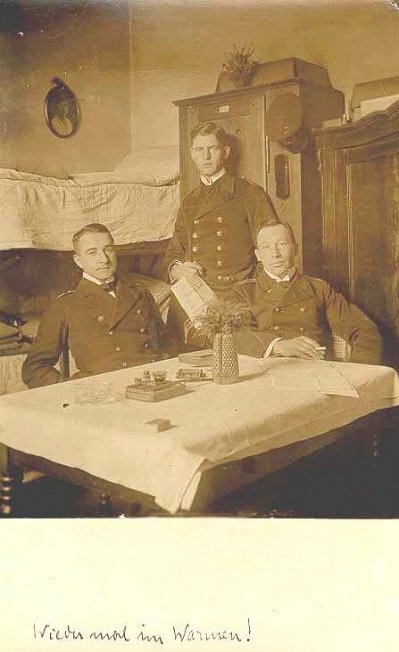 This is a post card photograph with no information on the rear side, therefore no information as to the occasion or the date. 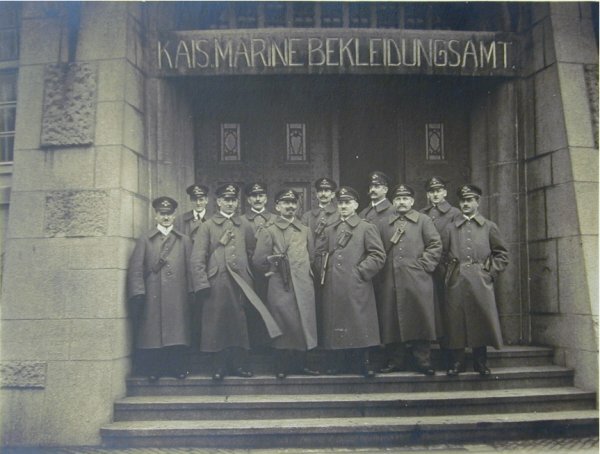 However the office location has been determined to be in Wilhelmshaven, Marinestation der Nordsee (North Sea) based on an original official stationary seal of the KAIS.MARINE BEKLEIDUNGSAMT. 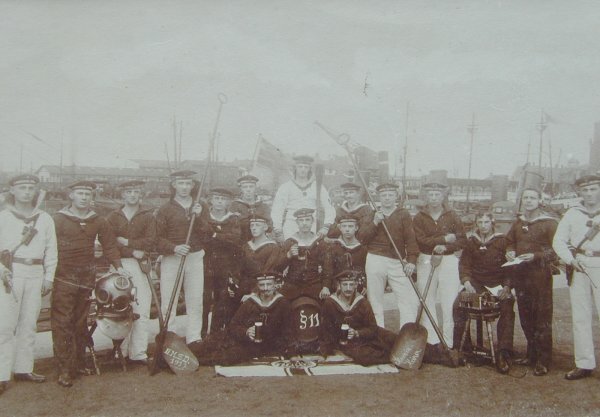 Original post card "Unterseeboots crew with P.04 rigs & cutlasses" sent 4/20/15 from Kiel. On the back is the following (translaled)letter, "Dear Sister, Today I'll write some rows. How are you? You seem to be very busy because I don't hear anything from you. I am still fine. Our infantry training has ended and in 4 or 5 weeks I'll probably be on board. On the other side you can see me as white boy. Not very fine. I am looking too serious. What about lotty? The weather here is fine. We are allowed to go out every day. Kiel is a pretty nice town. If only I could get some more money. The soldier's life is a nice life also now in war time. If we only could get some more bread. But here we learn everything. That's all. Much greetings from your brother. Greetings also to all relatives. Please write!" 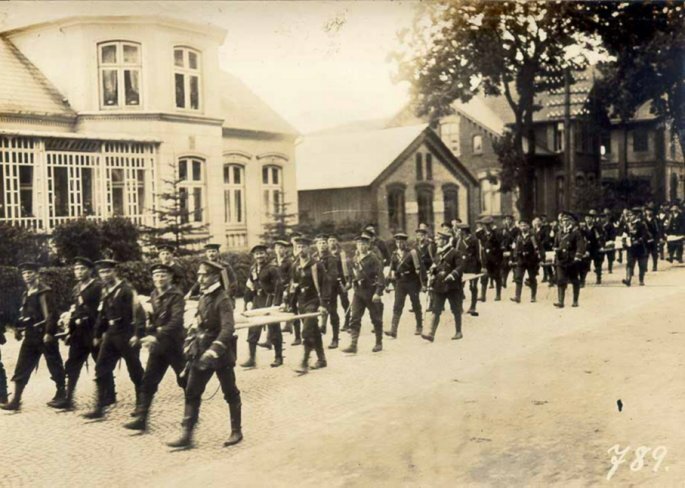 Collection of three photographs showing the Imperial German Navy troops marching to their boats at the docks. Upon close inspection, it is possible to see that most of the soldiers are equipped with a P.04 rig. The local population is at the docks to see the troops off to WWI. German Dress/Presentation Seitengewehre 98 Bayonet. 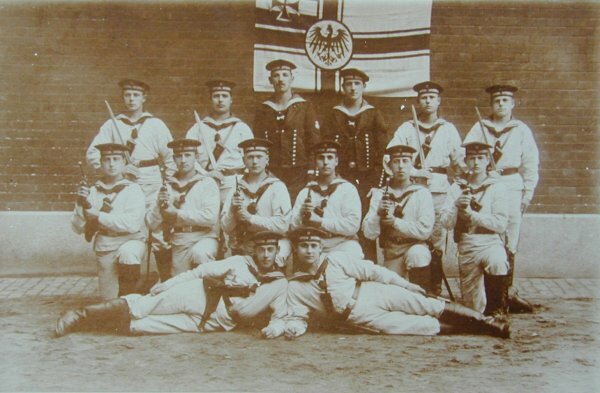 1902 NAVAL OFFICER SHORT DIRK - Stürz, Dresden. Kaiserliche Marine 1902 style short dirk line drawing. 1991 German unity dagger. 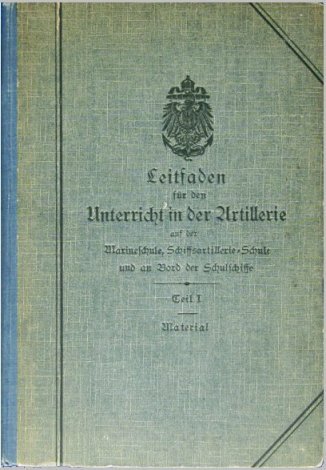 This book details all the large guns mounted on the Kaiserliche Marine ships. 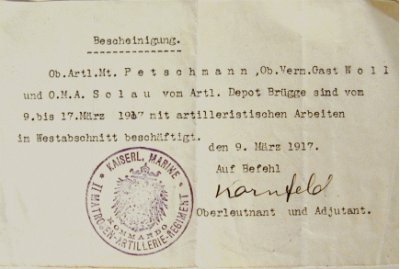 Shown above is a passage certificate for the wife of the navy master builder Klautsch for the area of Fort Wilhelmshaven for the period between June 1918 until June 1919. 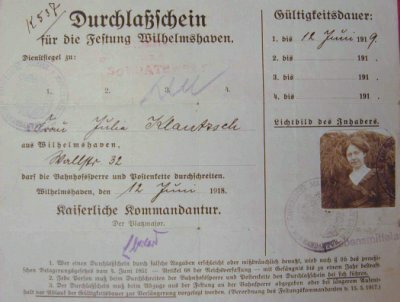 The document contains a photo, service seal of the commander and red stamp worker of the Kaiserliche navy at Wilhelmshaven and soldier advice. Interesting time-historical document in good condition. Evaluation scale for rating leadership and the leiftungen skills in the military training. Click on arrows to view pages of pamphlet. These pamphlets were utilized mainly by the Kriegsmarine but also by other units and although official looking, they don’t appear to be of official military issue as indicated by a price of RM. 0.60 printed at the bottom of each pamphlet. The “Shooting-Training” pamphlet No. 3 has illustrations and text sections relating to the Parabellum 08, Mauser Rifle Das Gewehr 98, gasmask, and grenade. 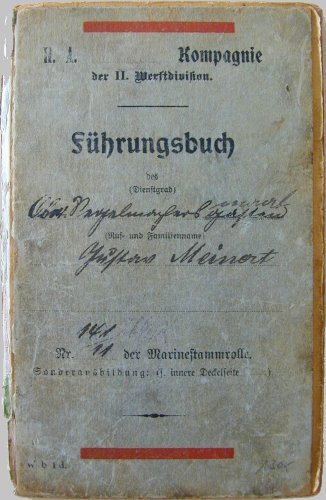 On page 5 is a short paragraph titled Schußleistungen der Pistole 08 or Shooting Performance of the Pistol 08. Page 10 is completely dedicated to a technical-mechanical description of the pistol titled Die Pistole 08. Page 12 has a paragraph discussing The Impact of the Pistole 08 or Die Wirkungsweise der Pistole 08. This paragraph in actuality is a description of the operating cycle of the gun. 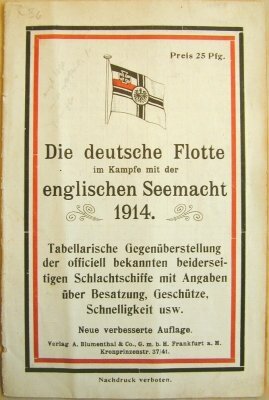 The pamphlet series shown consists of numbers 1, 3 and 4; however there may be additional pamphlets as similar Kieler documents were printed throughout the war, examples being two 1942 Kieler publications, No.28 and No.29. Nevertheless, numbers 1, 3, and 4 represent a very scarce grouping as few survived World War II. Copyright © 2002, Land of Borchardt, All rights reserved.